There are many different types of beadwork. In the most general sense, beadwork is any type of work with beads. 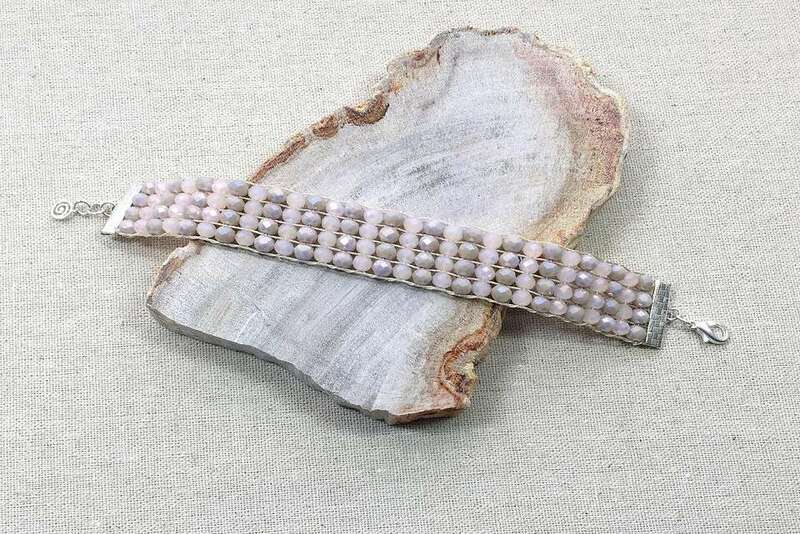 Commonly recognized forms of beadwork include bead stringing, off-loom bead weaving, bead looming, bead embroidery, braiding with beads, and wire wrapping with beads. There are others, but those are some of the most common types of beadwork. Bead stringing is the most straightforward form of beadwork, but that doesn't mean it is the simplest. Stringing beads involves adding beads to any type of thread, cord, elastic, leather, beading wire or similar material. The resulting beadwork can be a single strand, multiple strands, or braided strands. The beads may be separated with knots, such as pearls often are, or other spacer beads. Stringing beads on an elastic cord is a great way to get started making beaded bracelets. Stringing beads on beading wire is a great way to make necklaces, bracelets or even earrings. Some beadwork is done by using a needle and thread and one or more beading stitches to create an intricate chain or fabric of beads. This type of beadwork is referred to as off-loom bead weaving. Beadweaving is most often done with small beads called seed beads. These beads were named because of their resemblance to seeds. Seed beads range in size from very small to large, and even include different shapes such as cubes, bugle beads and drop beads that do not necessarily share the small, round shape of a traditional seed bead. Seed bead sizes range from size 15 (very small) to size 6 (very large). The size of the bead roughly corresponds to how many of that bead laid side-to-side will fit into one inch. Therefore, the larger the number, the smaller the bead. Off-loom bead weaving is done by using a needle and thread to stitch tiny beads together. There are several different beading stitches that are used to connect the beads. Each stitch has its own unique thread path and creates a different type of beadwork. Some common beading stitches include peyote stitch, brick stitch, herringbone stitch (also called Ndebele), right angle weave, netting, spiral rope, daisy chain, chevron stitch, square stitch, and dutch spiral, to name a few! Many of these stitches have variations which will make either a flat strip of beadwork, a round tube, a spiral or a flat circular shape. Off-loom beadwork stitches such as brick stitch and peyote (or a version of peyote called gourd stitch) have been used by Native Americans to make jewelry and embellish utensils and other items. A bead loom is a device used to weave beads into a cloth-like beaded fabric. It can be used to create strips of flat-beadwork or larger sized beaded panels that can be incorporated into purses or used as artwork. In loom beadwork, the beads align in rows and columns. Loom beading is faster than off-loom bead stitches but requires some additional steps to set up the loom before you can get started with loom beading. Bead embroidery is another type of beadwork where beads are stitched or sewn onto a fabric or backing. There are several types of bead embroidery stitches, and bead embroidery can be used either by itself or in conjunction with another craft such as cross stitch or quilting. Bead embroidery is one of several beadwork techniques favored by Native Americans for embellishing clothing and other items. Bead knitting, bead crochet, kumihimo with beads and macrame with beads are also considered beadwork. To do bead knitting or bead crochet, the beads are first strung onto a heavy thread in a particular pattern and are then incorporated into the knitting or crochet. Kumihimo is a style of braiding that uses a disk, but the beads are also strung in advance of braiding. Macrame is a knotting technique that can incorporate beads into the overall design.